Well that sucked. 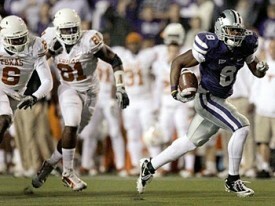 I was hoping to wake up in a world where Texas didn’t outgain Kansas State 310 to 121 last night and still lose. Oh well. 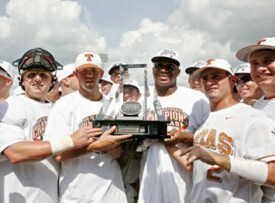 The Memorial Day weekend got even better on Monday when ESPN announced that The University of Texas baseball team will be the number 1 seed in the upcoming 64 team College Baseball Tournament. The Longhorns will be joined by Texas State, Army, and Boston College in their opening regional bracket. The likely match-up in the super regional is TCU. If not TCU, it could be Texas A&M. The number 1 seed ensures Texas won’t have to leave Austin to play a baseball game unless they make it to the College World Series in Omaha. A trip I’m sure they’d be eager to make. Texas got the weekend started by winning three straight games in Oklahoma City to capture the Big 12 tournament championship. The team got off to a bumpy start in the tournament with an opening game loss to Baylor. But wins over [tag]Kansas[/tag] and [tag]Kansas State[/tag] followed by a championship game win over Pool B winner [tag]Missouri[/tag] gave Texas their fourth tournament championship. The Longhorns win the tournament for the second straight year. The Texas Longhorn baseball team wrapped up the 2009 regular season with a double header sweep over an overpowered Alabama A&M squad. Head Coach [tag]Augie Garrido[/tag] used the late season matchup to get his staff ready for the upcoming Big 12 tournament in Oklahoma City. The Longhorns will enter the conference tournament as the number #1 seed. Texas will face #8 seed [tag]Baylor[/tag] on Wednesday at 12:30, [tag]Kansas[/tag] on Thursday at 3:00, and [tag]Kansas State[/tag] on Friday at 12:30. The finals take place the following day between the top teams in each pool. [tag]Oklahoma[/tag] and A&M are the favorites in pool B. Despite an occasional dry spell at the plate this year’s Longhorn team has performed better than any team since the championship squads. Texas sports the best pitching staff in college baseball, and in post season play pitching depth is as important as point guards in March Madness. Garrido’s group still has question marks behind the plate, but the lineup has shown the ability to score runs if they can get on a roll early. Texas has all but locked up a top 8 national seed. The granting of a top 8 seed would guarantee the Longhorns wouldn’t have to leave Austin until the College World Series, if they were good enough and lucky enough, to make it.